BISC's hopes of re-establishing itself at the top of British synchronised skating have been hit by the rink's decision to take away some of its ice time. The loss will hit the club's top figure skaters and ice dancers too. Ice Metrics, the club's junior synchro team, has won medals at every British Championship since 1998 and represented Britain internationally each year including two Junior World Cups. 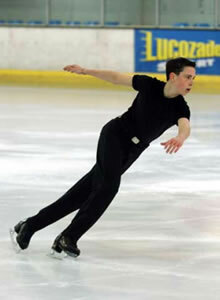 Ice Precise, the novice team, won British gold in 1998 and 99, medals in each subsequent year and represented Britain in at least two internationals each year. But a slump in skaters taking up the sport meant although Ice Metrics went from strength to strength as skaters moved up from Ice Precise, the younger team was less able to maintain its numbers and last season failed to skate at all. 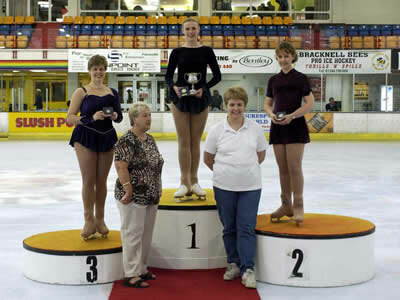 However Ice Metrics and Team Emotion, the club's new mixed-age team, both won silver at the 2003 British Championships. Realising it was about to lose several of its older members, the club set up a synchro development section last year to encourage more members to try this branch of the sport. "We thought it best to re-build from the base up," said club vice-chair Sacha Hartley who has just taken over as one of two managers of the synchro teams. "It was beginning to work well with the synchro development section providing skaters able to move on to Ice Precise - which has been re-formed this season - and eventually Ice Metrics." Now the club is having to suspend the section due to a loss of ice time. Because the Bees ice hockey team wants to change its training times, BISC has lost its 45 minute sessions on Tuesdays and Thursdays. Although it has been given an extra hour on Friday - when the mixed age and novice teams already train for an hour - it means the club is having to abolish synchro development so the two established teams have sufficient ice time. And even they won't have use of the extra hour all year because of rehearsals for the National Team Challenge and pantomime. News of the lost ice time led to an emergency meeting of the club's committee which is to monitor the situation. BISC member Rachel Jarvis has fulfilled her childhood dream …. 30 years on. Rachel always wanted to skate as a child but did not live near an ice rink. Now a 37-year-old primary school teacher and mother of two, she has not only mastered the spins and jumps she so wanted to be able to do when young, but she is winning medals in national and international competitions! And it's nearly all thanks to her daughters, Eleanor, 15, and Bethany, 10. "I used to love watching ice skating on television when I was young and wanted to do it myself but we didn't live near a rink," Rachel said. Unlike the majority of people who do not begin skating until they are adults, Rachel has opted for figure skating, with its jumps and spins, instead of the more sedate ice dancing. And she is almost keeping pace with her daughters. While they have passed their Level 4 elements and free skating and bronze field moves tests, Rachel has passed Level 3 elements and free and is working on her bronze field moves. But being a teacher has made it difficult for Rachel to compete in Open competitions which are usually held on weekdays. However she decided to go for it this year and entered the Bracknell Adult Open where she won silver in the over Level 2 class and the World Ice Challenge, an international competition for adults held this year at Slough, where she won bronze in a class for skaters up to Level 4. Now she has her sights set on the British Adult Championships at the end of September. "I'm really looking forward to it." she said. "I am thrilled to have won the two medals especially as I haven't been able to do many competitions. "You get tremendous enjoyment when you master a new element or when you are skating a programme and of course it is an excellent way to keep fit. Because I love it so much it doesn't seem like exercise. It just seems like fun." The Bracknell Academy's summer camp this year was indeed an elite one, not because of the quality of the skaters taking part, but because there were so few of them. However the 20 free skaters who did sign-up for the four-day event learned a lot and improved their skills. They were divided into three ability groups and benefited from input by nearly all the rink's free skating coaches as well as Simon Waller whose coaching style proved very popular with the middle group. He also demonstrated elements for the two other groups. Sadly dancers showed no interest in the four-day camp that would have been held for them but the one-day synchro camp at the end of the week proved very popular.